For those of you unfamiliar with the premise, Argo is a movie about a fake Sci-Fi movie that was promoted in order to get one guy into Iran and back out with six employees of the American embassy in Tehran. When the 1979 riots started, the six thought they could sneak out the back and flee to the Canadian embassy, not realizing that maybe they would have been a little better off in with the hostages. Either way, their decision had been made and the CIA has to work against the clock to get them out of the country. Part of the problem is that when the rioters started crossing the wall and all the employees could start getting rid of personal information kept there, the incinerator stopped working. They shredded as much as possible, but once the rioters are in and running the show (read: hostage situation) they hire child laborers to reassemble the strips. The runaways only have until either someone breaks into the Canadian embassy or realizes they never go outside or figures out they're missing or... yeah. They are in serious trouble. Getting to know their new identities before the Iranians put it together. Literally. The CIA's brilliant ideas include sending them bicycles so they could bike to the Turkish border... 300 miles away... in winter... Yeah. So they bring in this guy, Tony Mendez. Tony's job is to get them out. As he watches Star Wars with his kid he realizes that the whole world loves SciFi movies right now, and with CIA and Canadian support (as well as that of a big-shot producer and a make-up guy in Hollywood) he lays the foundation for shooting a movie meant to take place in a middle eastern location. Now, just to be clear, I am fully aware that the movie is a dramatization. I totally don't mind. It's a bit of CIA propaganda (making up for the fact that they were not allowed to take credit for the rescue at the time). I really don't mind. This is one of the best "based on a true story" movies I have ever seen. Ben Affleck has come a long way since Gigli and I am completely willing to forget his other shortcomings. He acts in and directs the film masterfully. I'm not the only one who thinks so--Mark Lijek, one of the six rescued from Iran back in 1980 wrote that he left the theater sweating just as much as he did getting onto the plane to get out of Iran. He also wrote that if the situation were quite as high pressure as the movie depicts, he might have cracked. Kinda like their poster did. The late 70s/early 80s feel is captured so well, as is the drama and riotous feeling in Tehran at the time. As the actors pace back and forth across the screen, I want to get up and pace with them. I feel their fear of the unknown. I sweat and cry right along with them. The drama may be in large part fabricated, but it is a fabulously well-done show. I think the best way to appropriately wrap this up is with the high-five I mentioned at the beginning of the post. Here's to you, Ben Affleck. May your next movie be at least as awesome and just as well done. Notice how Seth Meyers totally points at Iran. He knows. 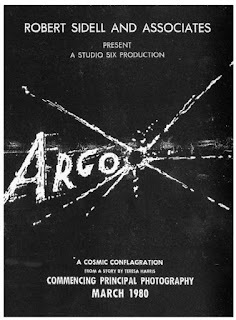 Argo also wins the John McClain Memorial Award for best use of profanity in a movie.